What do you get when you lock together a liberal political activist, a conservative senatorial aide and the sparkly Miss Georgia? The answer is a hysterical political farce with all the crackle and tension that can be packed into one hotel room. 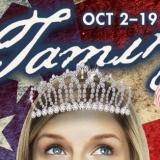 Dishing up a good ole heaping of Southern fried politics, Lauren Gunderson’s THE TAMING takes on America’s overheated bombastic polarity, upends the historical truths of our Founding Fathers, and plays with the passions of three wacky women who may well be revolutionary geniuses in disguise. Marking the third Gunderson play to be produced on the ArtsWest stage, THE TAMING follows the rollicking Exit, Pursued By A Bear and the poignant Emilie: La Marquise du Châtelet Defends Her Life Tonight in bringing the startling humor and rich roles for women that Lauren writes so well. This Co-World Premiere, presented simultaneously with Crowded Fire Theater in San Francisco, will once again bring rip-roaring belly laughter that catches audiences by surprise. Initially inspired by The Taming of the Shrew, Gunderson’s own words describe comedy as serious business. “I’m a firm believer in comic activism, the kind that attempts to skewer the unfair and thoughtless. When we laugh at idiots, we erode their power. Comedy encourages (demands) that we be vocal in the face of the absurd. Our laughter is our outrage, our change-making, our hope for better.” Set with this context in mind, THE TAMING, will appeal to audiences that love to laugh, love to learn and are willing to challenge their pre-conceived ideas. Hey, y’all – let’s talk. Politics are hot – southern hot.